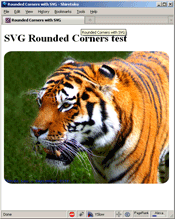 Today I came across the Applying SVG effects to HTML content article on the MDC wiki, one of the things it discusses is using SVG as a clipping mask for HTML elements. 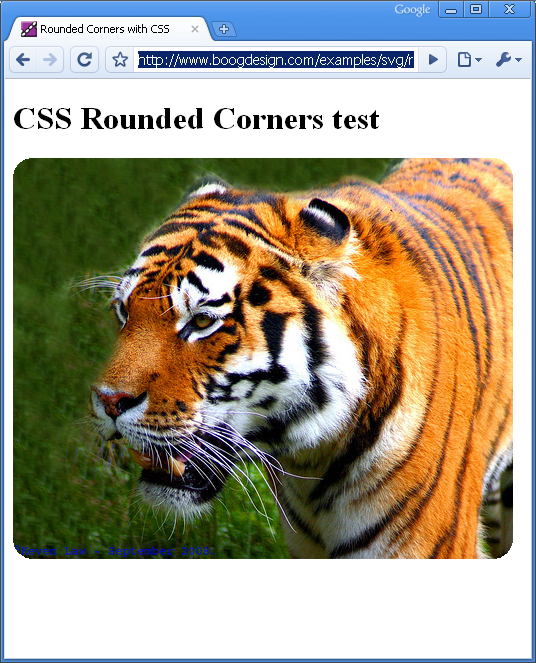 It occurred to me that it ought to be relatively straightforward to use a clipping mask to create the rounded corner effect directly on an img element in Firefox. Here is the full code. Of course, embedding it all this way isn't going to work for any browser other than Firefox 3.5, and serving application/xhtml+xml is going to break Internet Explorer, so it's not really a practical solution in it's current state. It's more useful to break the content into separate files, then the SVG can be served as image/svg+xml while your HTML is text/html. 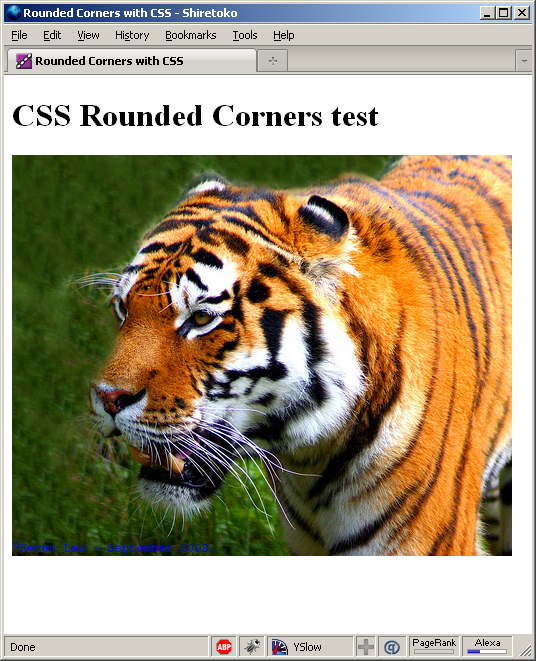 This final example works across browsers and will round the corners of the image in Chrome, Safari and Firefox. "It's more useful to break the content into separate files, then the SVG can be served as image/svg+xml while your HTML is text/html." I followed the link, and I understand that server configuration is important, but still I don't quite understand how to create the SVG resource file, where that goes on the server, etc. The problem I'm referring to is that, in order to have the SVG included in the HTML recognised you have to serve the whole page as application/xhtml+xml. This leads to problems in IE, because it will then prompt you to download rather than display the web page. If you put the SVG in a separate file then that can be served with it's own content type but the HTML can be served as standard text/html to be backwards compatible with Internet Explorer. 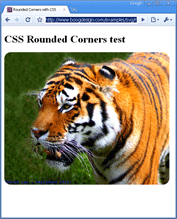 If you look at the page linked to from the text 'final example' at the end of my post you will see there is an external CSS file, rounded-corners.css, which then links to resources.svg to pick up the clipping rectangle. 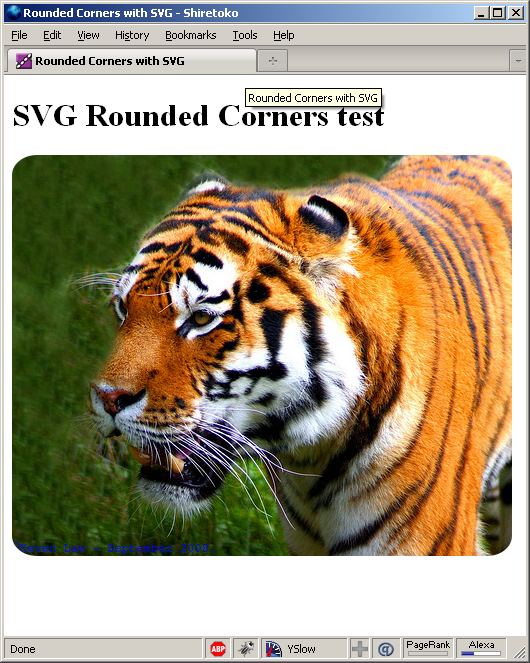 I found my apache was already correctly configured for SVG and using the correct content type. All the files are in the same folder, so you should be able to download them easily. You just saved my life?this was driving me CRAZY. Hi Bert. You would have to mess around with co-ordinate systems to get pixel equivalent values, a quick hack might be to use unequal values for rx and ry. 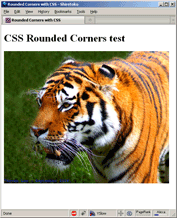 Note that in Firefox 4.0 the issue preventing the use of CSS border-radius is now resolved fixed.